Lebron James is an Akron,Ohio native who has grown to be considered one of the greatest players of all time. He has dominated nearly every playoffs since his start in the league and this year is no different with the Cleveland Cavaliers superstar. 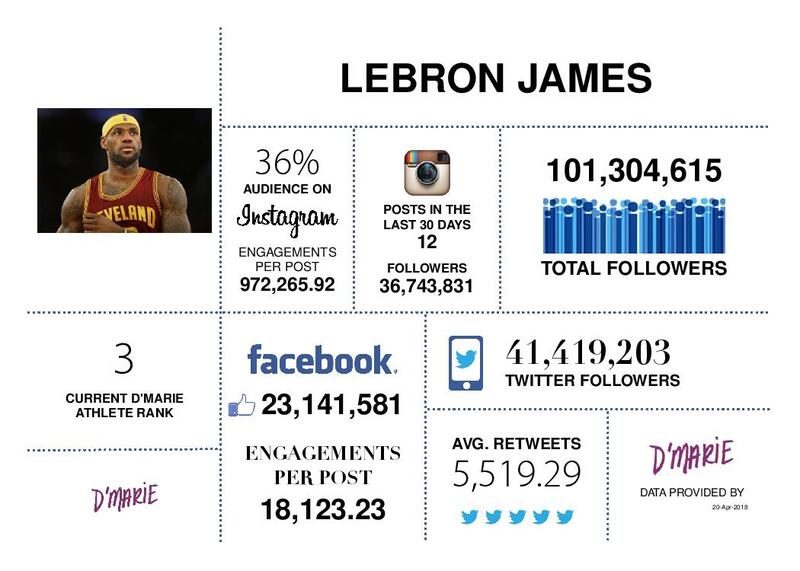 With over 100 million total followers across all social media platforms, James has also become a major influence as well. But while his life and accomplishments keep us captivated on social media during the regular season, he is known for going dark for the postseason in order to focus on his play. This has caused his overall value per post to drop from $230,000 to just over $190,000. Yet as Lebron enters “Zero Dark Thirty-23 Mode”, it will be exciting to see if he can add another championship to his ever growing legacy. Dwyane Wade has solidified himself as an NBA Legend and he also just so happens to be best friends with another member of this list, Lebron James. Though he started this season playing with Lebron and the Cavaliers, he is back in the playoffs with the Miami Heat. 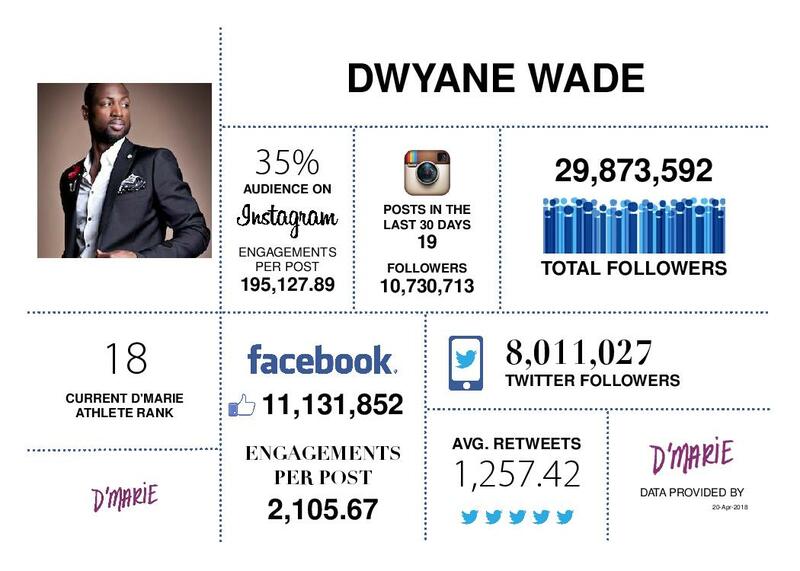 Wade has amassed 10.7 million followers on Instagram and some this following can be accredited to his great relationship with Lebron. As the two document their friendship and interact frequently on the platform, both of their influencer values grow. But unlike James, Wade shows no signs of cutting off his social media as he has posted 19 times in the past 30 days to his Instagram. Wade will continue to update his followers as he leads the Heat through their playoff run. 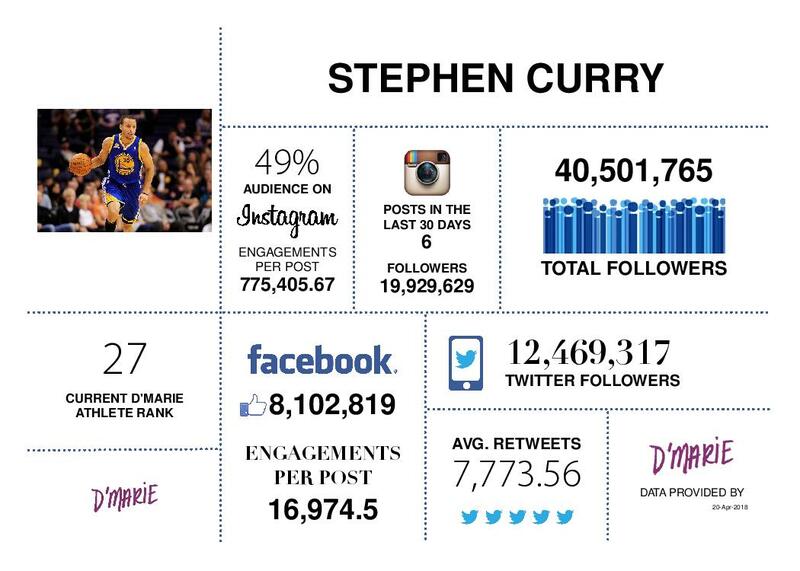 Stephen Curry has become a household name over the past few years and with this has come an influx of value to his social media profiles. Last years finals matchup saw Stephen Curry and the Golden State Warriors pitted against Lebron James for the third consecutive year. During this series in June of 2017, Curry saw his value per Instagram post peak at just over $300,000. While it has declined throughout this regular season, the potential for another Cavaliers matchup will surely spike his value come Finals time. 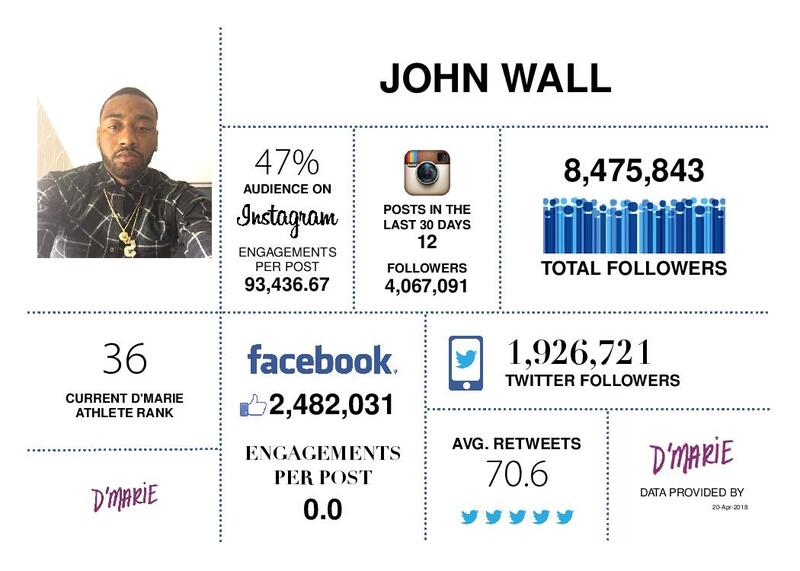 John Wall is the bold and confident 27-year old point guard for the Washington Wizards. The former number one overall pick has led the Wizards to a first round playoff matchup with the Toronto Raptors. His online and in-game interactions with the Raptors Global Ambassador, Drake, have increased his followers but subsequently decreased his overall value per post as the Wizards are now down 0-2 in the series. Wall has been known for being assertive on the court and on his Instagram. This shows as Wall has an average of just over 93,000 engagements per post. Yet it seems that this clout is not enough as Drake and the Raptors are in position to eliminate the Wizards from the playoff picture. Klay Thompson has seemingly discovered a newfound confidence in himself not only on the court, but on social media as well. Coming off his championship win with the Golden State Warriors this past year, Thompson’s value per Instagram post has increased from $16,000 last June, to just over $55,000 this past March. This can be credited to his increase in posting on Instagram where 57% of his audience resides. With the Golden State Warriors poised to make another run at the Championship this year, Klay’s value and following will continue to rise.